The Baseline rule (5.09 (b) (1) played a major role in preserving A’s pitcher Sean Manaea’s no-hitter against the Red Sox on Saturday night. 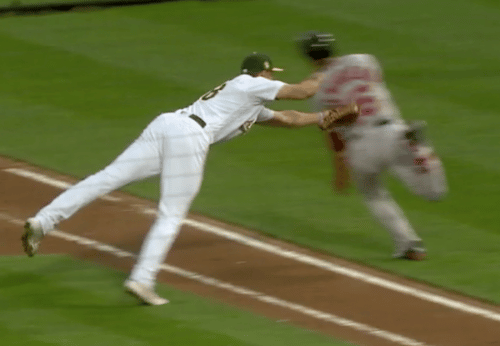 With two outs in the sixth inning, Boston left fielder Andrew Benintendi sent a soft grounder up the first-base line and was ruled safe at first base after first baseman Matt Olson failed to tag him. After a lengthy conference, however, the umpiring crew deemed Benintendi to be out of the baseline, thus taking away the hit and ending the inning. You can view the play by going to the link below. Any runner is out when he runs more than three-feet away from his base path to avoid being tagged unless his action is to avoid interference with a fielder fielding a batted ball. A runner’s base path is established when the tag attempt occurs and is a straight line from the runner to the base he is attempting to reach safely. Until the 2017 season, the defensive player had to make a definitive tag attempt with ball in glove or hand to restrict the runner’s 3-foot baseline. No longer is the tag attempt with ball in glove extended or ball in hand extended necessary. Below is the 2017 update of the baseline rule. OUT OF THE BASEPATH Rule 5.09(b)(1) When determining whether a base runner should be called out under Rule 5.09(b)(1), so long as the umpire determines that a play is being made on the runner and an attempt to tag is occurring, i.e. the fielder is moving to tag the runner, no physical tag attempt is required to call a runner out for leaving the base path. Ironically, it’s the fielder who establishes the runner’s baseline. The moment the fielder with ball in glove or ball in hand makes a move toward the runner, the runner’s baseline is “restricted.” It is a straight line to the base he is going to and the runner cannot exceed 3-feet to either side of the direct line to the base. The play is umpire judgment and is not reviewable. THE RUNNER ONLY HAS A BASELINE WHEN HE IS AVOIDING A TAG OR IS IN A RUNDOWN. BENINTENDI WAS AVOIDING A TAG-THEREFORE, HE HAD A BASELINE. In a rundown, the runner has a straight line to the base he is going to and is allowed 3-feet to either side of the line. A tag attempt is not necessary. THE RUNNER’S LANE IS NOT A BASELINE. The Runner’s Lane was not the issue. That Lane is to protect the fielder “taking” the throw, usually from the pitcher or catcher in the bunt area and is a separate rule. There was no throw in the above play. It was a simple tag attempt. In such plays between home and first, you should erase the 45-foot long, 3-feet wide RUNNER’S LANE. The issue in the above play was the RUNNER’s BASELINE. The moment Olson made progress toward Benintendi, you should freeze the action. At that point Benintendi had a restricted baseline. It was a straight line to first base and he was allowed 3-feet of real estate to either side of that line. Did he exceed the allowed 3-feet? Ignorance of the baseline rule was glaring. The fans viewing the contest were exposed to a litany of misinformation. The broadcasters focused on Benintendi being out of the Runner’s Lane. Not one zeroed in on the actions of Olson and how he established Benintendi’s baseline the moment he “moved” toward the Red Sox runner. One validated the call because it preserved a no-hitter. Wow! To call “out of baseline” plays correctly, it’s critical that the emphasis be placed on the defensive player who creates the baseline by his actions toward the runner. The moment Olson made progress toward Benintendi, you should freeze the action in your mind. To repeat, at that point Benintendi’s baseline was a straight line to first base and he had 3-feet to either side of the line. Did he exceed the 3-feet? If it’s possible to graphically show the baseline by drawing a line to first base on the screen the moment a fielder (Olson) moves toward a runner (Benintendi) and explain that a runner (Benintendi) is allowed 3-feet to either side of that line would be a service to the viewers. This would create a video metric, most likely never seen before. Umpires erase the Runner’s Lane when tag plays are made between home and first base. Broadcasters should do likewise- and educate themselves about the baseline rule. It’s only fair to the fans! MLB Postseason Riddled with Rules Controversies Are Laces Part of the Glove?